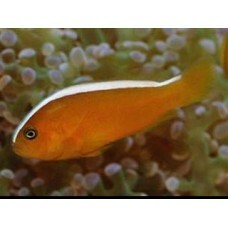 The Captive-Bred Orange Skunk Clownfish, also known as the Skunk-striped Anemonefish, is pale orange with one white stripe behind the head that runs down the entire length of the back. The Orange Skunk Clownfish makes an ideal reef tank fish, as it does not grow as large as some clownfish and pairs well in the home aquarium. A 30-gallon or larger aquarium with many hiding places is desirable. An anemone host such as Stichodactyla mertensii or Heteractis crispa is preferred, but not required. Captive-bred Clownfish are very hardy and durable fish making them a perfect addition for the novice or seasoned aquarist.